Turbulent blizzards, Everest avalanches, and devastating flooding in Kashmir have brought the Himalayas into the global media spotlight this year. 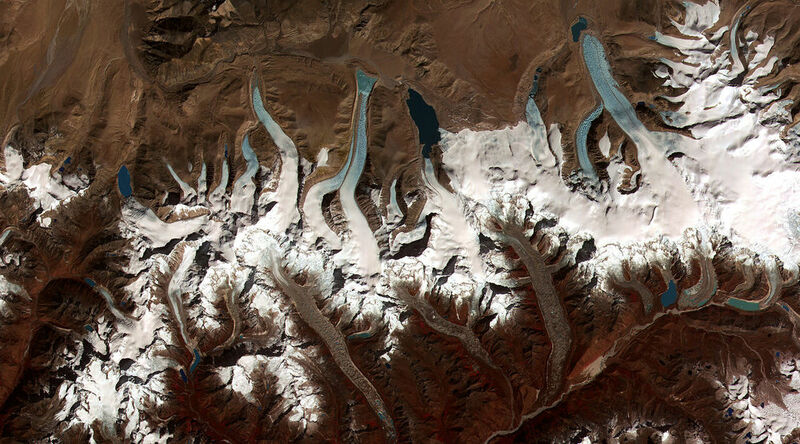 Glacial melt due to rising temperatures caused by increased carbon trajectories will cause avalanches at high altitudes, flooding downstream, and desertification when the water runs out. Responding to the climate change crisis is a global priority and also a business opportunity. A model of fusion economics is required, merging environmental solutions pioneered by grassroots civil society, with the power of business and finance to scale solutions and reduce costs. Often called the “third pole” because there is more snow and ice there than anywhere else in the world outside the polar regions, the Himalayas run through Afghanistan, China, and six other countries, all which share tense borders populated by multi-ethnic peoples. This region has possibly the highest concentration of diverse culture and religion on the planet. If the glaciers melt and water runs out, it would be a formula for disaster. The problem is down to one word – carbon. Scientists at the conference agreed that current output trajectories predict an increase in global temperatures of 3.7C - 4.8C (38.6F - 40.6F). This would push the planet past what environmentalists call the “tipping point”, when temperatures are too extreme for habitation as we know it. In street speak, humanity is on a fast track toward joining the dinosaurs. The Himalayan consensus response: total carbon output must drop, which means de-carbonisation of the energy supply, or significantly increasing zero and low carbon energy from renewables, nuclear, carbon dioxide capture and storage, or bio-energy. Investments in energy efficiency, insulation and recycling systems for water purification and water resource management are also imperative. An expected knee jerk reaction of business might be that it is not feasible to achieve these goals. But that is the whole point. The de-carbonisation of energy is practical. It offers a massive opportunity for business, and will possibly become the next engine of global growth in the two decades ahead. This is not about hugging trees, but moving markets. The Himalayan consensus is all about getting businesses to realize that the short-term costs of adopting renewable and efficient energy will be far less than the long term costs of fixing the problem. Moreover this global transition offers the financial sector with a potential plethora of new products to re-invigorate capital markets. The analysts have failed to say what the scientists dared to speak: GDP will be minimally affected by mitigation action through replacement energy innovation, while the cost to business of non-action will rise astronomically in the decades ahead. Expect additional costs to government and business from a global refugee crisis caused by outward migration from those environmental disaster zones we are now creating. No wonder protesters at United Nations Climate Change talks in New York stormed Wall Street. They knew more clearly than the politicians making vapid speeches within the UN that combatting climate change comes down to business, and ultimately the financial sector that drives it. Combating climate change through new technologies, infrastructure investments, and financing may prove in the self-interest of business. It will cut costs, create jobs, and be the next mega-trend. Himalayan consensus and fusion economics are about convening stakeholders from environmental and social science, grassroots, civil society, business, finance and government, in building pragmatic solutions. In fact, these interests have more to gain in working proactively together than viewing each other as being in conflict. It all comes down to the power of of changing perspectives. In the past, business and finance have seen environmental scientists and civil society as “those activists” who block business interests. Actually, they should now be seen as the innovation, research and development teams that can drive the next global growth trend – the de-carbonisation of energy.